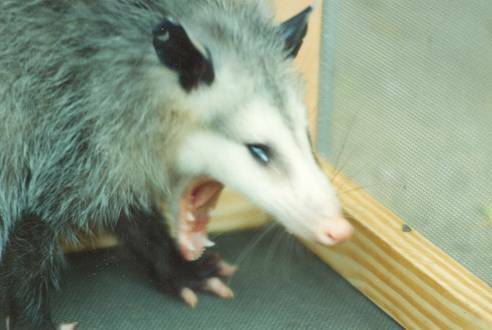 Most people don’t realize that Al Qaeda modeled their terrorist suicide bomber training camps after the opossum training camps deep within the Big Cypress Swamp within the Everglades. I don’t know this for a fact but having walked many a mile along Florida highways looking for snakes I have found evidence; dead opossums lying in the road with guts splattered everywhere- evidence of a suicide attack! The possums gang up at night waiting for a car to come speeding down the road. 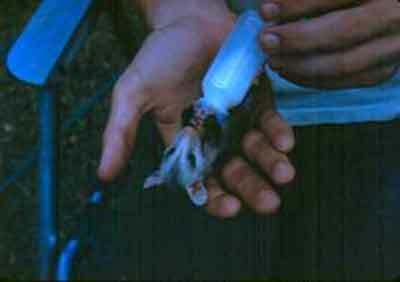 One opossum will be elected to volunteer for the mission. Just as the car approaches and with the stopping distance gone, the possum will dash into the headlights hoping the oncoming car will swerve and crash into a tree. If successful, the rest of the gang will dash out and attack the vehicles driver and loot any food in the car. If unsuccessful… well…. then there are possum guts and blood everywhere. The others go back to terrorist camp and work on new ways to scare the crap out of drivers. 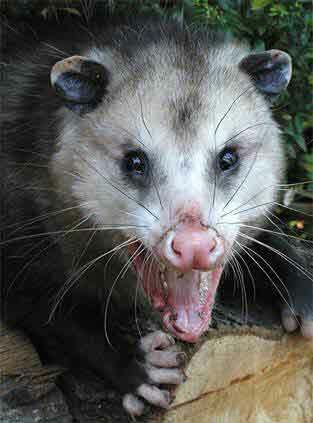 Below is a picture I grabbed off the internet for those of you who haven’t seen a possum up close. This picture is better than any of mine. 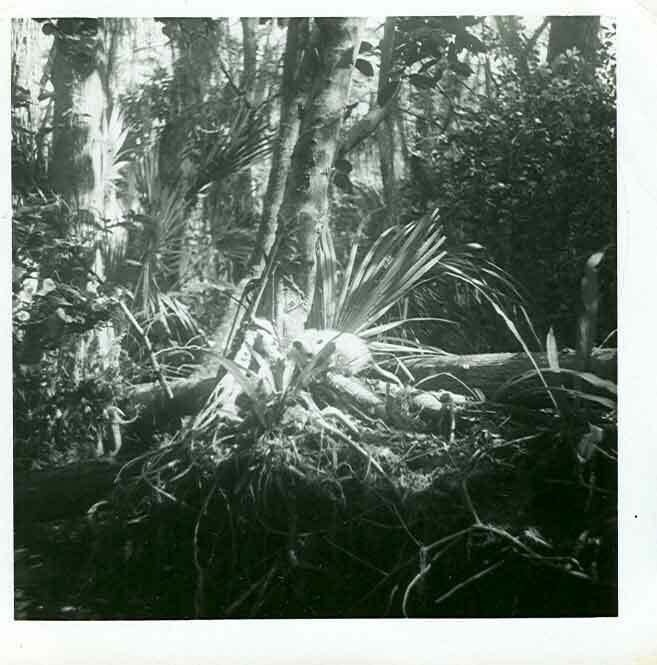 One bright sunny morning we were walking along the shoulder of Tamiami Trail (Hwy 41) in the middle of Big Cypress Swamp looking for snakes and up ahead we could see a group of buzzards eating something in the road. As we got closer we could see it was a squished opossum, just another road kill victim from a failed suicide attack. 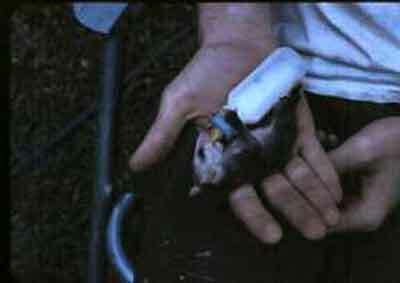 The opossum body looked as if it had been a suicide bomber, guts were everywhere on the road. One of the guys spotted movement in the opossum and used a stick to investigate. In the mother’s pouch he found three tiny babies, pinkies’ as we would call baby mice or rats that had no hair and eyes were still closed (snake food). The opossum is the only marsupial in North America. What’s a marsupial? Think of a kangaroo with a baby peering from momma’s pouch- that is a marsupial. How long have opossums be around? A long time, according to fossil records, over 70 million years. Yes, they lived with the dinosaurs. Just thirteen days after the adult opossums mate the underdeveloped opossum babies make their way from the birth canal to the pouch. The eyes are not yet developed and the mouth is just a small hole. 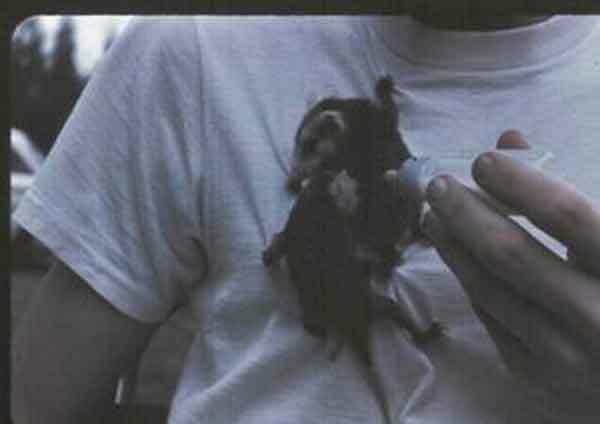 It is a miracle that the little pink things have the muscle power and navigation skills to locate the pouch. Once protected within momma’s pouch the pinkies will develop into juveniles and venture into the world yet still returning to the safety of the mother. So we had discovered three babies and now what should we do? We could leave them for the vultures or try to rescue them. I put the three little pink things in my shirt pocket. Once back in Miami I set to work. First I bought a doll baby that came with a baby bottle. The bottle just seemed better than an eye dropper. Then I purchased some baby formula and watered it down. Soon I was feeding the three babies every few hours. But I still had to go to school. School would be a problem. Teachers forced me to sit in the front of every class; something about me being disruptive. I hollowed out a text book and poked holes in the cover for air. Inside the book I make a nice nest. The secret of my “Motherhood” did not last long. First day back to class I sat in the very back with empty seats between me and any students. This caught the attention of each teacher and I was compelled to reveal my secret. Surprisingly the teachers showed me compassion or perhaps the compassion was for the little ones. They were so nice to me- nothing like the time I turned a large tarantula loose in Algebra class, I hated algebra! After a few weeks one of the babies died but the other two continued to flourish. Soon the feedings dropped from every three hours to just a few times a day. Opossums are such messy eaters. I would feed them outside. After spreading newspapers on the patio I’d set down the bowl of food. Faces stuck into the bowl gobbling food in one end and pooping out the other. When they had finished I’d roll up the papers and discard then I’d wash their feet. These pictures are old 35mm slides that survived a flood in Miami so the quality is very poor but still useful. Somewhere there is old movie footage of the little guys near adulthood and they are climbing all over me. Opossums just don’t make pets like a dog or cat. They don’t play “fetch” and can’t be taught to “shake hands”. I did get mine to learn to “roll over and play dead” but I had to scare the crap out of them in order to do the trick! The babies did want love and attention but they wanted it possum style; no licking, no noise, all they wanted was to hide their head and be petted or just crawl all over me. They loved riding in my shirt pocket, standing up with just their heads peaking out watching the world. It’s not a good idea to let a possum loose in the house. They may appear slow and clumsy but can dart under furniture making capture almost impossible. They wouldn’t come to me in the house unless hungry. One evening Possum Pete was hiding inside the back of the living room couch when a friend came over, she had never met Pete. Apparently Pete felt the pressure of her body against the back of the couch and he decided to go elsewhere. He darted out of the couch and headed across the living floor trying to make his way to the kitchen. As usual, there was screaming and the visitor ran from the house. Several days later word came back that my house was infested with wharf rats. Go figure! Some people are so stupid. With a dog you can get clues about the emotional state. Dogs seem to smile and do wag their tails. Not so with possums. Even when happy their mouths would be open with teeth showing. And then there was the ever present drooling. The next picture is a recent shot of a possum caught in my backyard. I think he is happy- what do you think?? One day while playing in the back yard the female darted off and disappeared in a thick hedge never to be seen again. The male, Pete, (you know- Peter Possum), missed his sister and began paying more attention to me. He’d waddle across the yard and climb up my pants, then my shirt, climbing all the way to the top of my head. Daniel Boone wore a dead raccoon on his head- I, on the other hand, wore a live possum! When Pete became fully grown it was time to turn him loose. I took him back to near where I found his mother and hiked deep into the swamp with him riding on my shoulder. After placing him in a safe place I said my good-byes. I miss that furry thing. Rescued from his dead mother’s pouch, bottle fed, hand fed, and loved. It’s hard not to get attached even to a possum. Perhaps its’ because of all the animals I’ve raised or rescued; rats, possums, snakes, raccoons, Screech Owls, Barred Owls, hawks, turtles, and on and on. Whenever I’m out in the woods or swamp animals come to visit. Some come right up to me and others keep a distance but they still come to say hello. 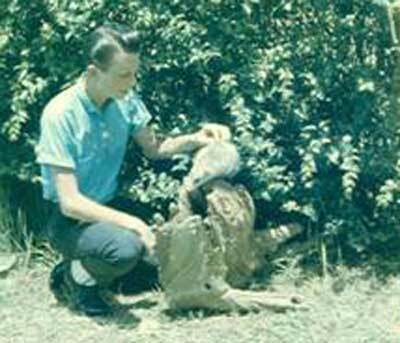 Just for fun go to the link below and watch all three episodes of “The Possum Death Spree.” Hold the control key down and then click on the link or just paste the address into your browser.